We’d love your help. 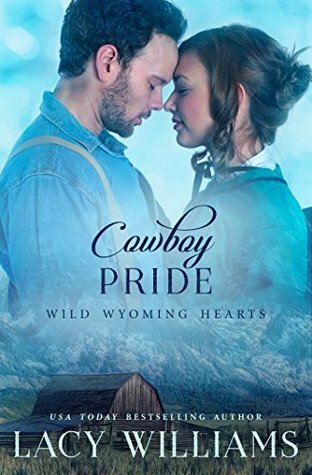 Let us know what’s wrong with this preview of Cowboy Pride by Lacy Williams. "Everyone knows a rancher in possession of a large spread needs a wife." Lacy Williams is a USA Today bestselling author of the acclaimed Wyoming Legacy and Cowboy Fairytales series. Liza Bennett has two missions in life: keep the family’s shop afloat, and ensure her shy sister finds love. Sparks fly when she meets rancher Rob D "Everyone knows a rancher in possession of a large spread needs a wife." Liza Bennett has two missions in life: keep the family’s shop afloat, and ensure her shy sister finds love. Sparks fly when she meets rancher Rob Darcy at a town dance, but when she overhears him insult her, she vows to put the man out of her mind. Rob Darcy is instantly attracted to the vivacious Liza but a lack of social graces and the promise he’s keeping ruin his chances of winning her. Once jilted, Janie Bennett is appropriately gun-shy of falling in love again. But she doesn't seem to be able to help herself when she meets charming Nathan Bingley. Bingley desperately wants a wife and family of his own. Can he trust that Janie returns his feelings? To ask other readers questions about Cowboy Pride, please sign up. I read this because it's the Big Library Read and I like participating in those. I regret doing it this time. This was supposed to be a western retelling of Pride and Prejudice. And it was. Though lots of things were removed (no Mary, Collins is already married) and the naming is weird. Darcy is Rob. Rob Darcy. He was Fitzwilliam Darcy. Doesn't it make sense that he would be William or Bill rather than Rob? But beyond that, the writing is simplistic and inane, there is no evidence of spellchecking I read this because it's the Big Library Read and I like participating in those. I regret doing it this time. This was supposed to be a western retelling of Pride and Prejudice. And it was. Though lots of things were removed (no Mary, Collins is already married) and the naming is weird. Darcy is Rob. Rob Darcy. But beyond that, the writing is simplistic and inane, there is no evidence of spellchecking, much less copy editing, and all personality of the characters is from the actual P&P that the reader then projects onto these cardboard marionettes. A cute little re-telling of Pride and Prejudice as a western. The nice thing about this story was that it was told from four different perspectives, those of the Elizabeth, Jane, Bingley, and Darcy characters. I enjoyed reading from all of their perspectives, getting a sense of the budding romance from all sides. It was quite amusing and definitely added to Williams' own definitive take on Austen's work. I will say, I did come across a plentiful amount of typos, which was a bit jarring, but I w A cute little re-telling of Pride and Prejudice as a western. The nice thing about this story was that it was told from four different perspectives, those of the Elizabeth, Jane, Bingley, and Darcy characters. I enjoyed reading from all of their perspectives, getting a sense of the budding romance from all sides. It was quite amusing and definitely added to Williams' own definitive take on Austen's work. I will say, I did come across a plentiful amount of typos, which was a bit jarring, but I won't let that count for too much, as this is definitely on the lighter side of reading, meant more to be enjoyed for its plot than for it's skilled writing style. Williams also had a way of over-using specific adjectives in describing some of her characters, almost to the point they seemed like epithets. Darcy is described as "highhanded" so many, many times it almost becomes comical. But, again, I let this pass because this is a romance - if the romance is good, I'll let it slide. And the romance was good - though it did seem at times a bit contrived. Almost any P&P retelling I read/watch comes across like this, however, because you know what's going to happen and, like with this book, you can map it out down to the chapter. While this was a bit off-putting, Williams puts in enough changes of her own (aside from just changing the scenery and time-period) to make it okay. I did like the little pieces she added to make it her own and I definitely could tell that this story was lovingly written. This book is a cute, Cowboy/Western adaptation on Pride and Prejudice. The author took some liberties with the characters (Mary, oh poor Mary doesn't exist in this) and plot lines but all in all, it's not a bad read. I do like the backstory the author gave Janie on why she's shy around Bingley (she had a bad experience in a prior relationship) but I also felt the Wickham storyline just popped up out of nowhere (he is literally in like one scene before he runs off with Lydia 80 pages later so that plot line doesn't feel as important/urgent as it does in the original). This book is okay, but not GREAT as far as P&P adaptations go. I usually participate in the Big Library Read even though so far most of the books have been somewhat disppointing. I also can't seem to pass any Austen adaptation, so when I saw that the latest BLR was a cowboy version of Pride and Prejudice, I had to read it. Unfortunately, Cowboy Pride does not possess any of the magic that makes Austen's novel such an enduring classic. We all know the story, though there are some notable changes. Liza and Janie Bennet are daughters of a leather goods store ow I usually participate in the Big Library Read even though so far most of the books have been somewhat disppointing. I also can't seem to pass any Austen adaptation, so when I saw that the latest BLR was a cowboy version of Pride and Prejudice, I had to read it. Unfortunately, Cowboy Pride does not possess any of the magic that makes Austen's novel such an enduring classic. We all know the story, though there are some notable changes. Liza and Janie Bennet are daughters of a leather goods store owner. Nathan Bingley has just bought a ranch near the town, and his friend Rob Darcy (who owns an even bigger ranch in another town) is visiting him and his (half) sister. Janie and Mr. Bingley fall in love almost immediately, but cause each other heartache because of their uncertainties and inability to talk about their feelings. Meanwhile Liza and Mr. Darcy also feel an immediate attraction towards each other, but have a much rockier start, mostly because of his tactlessness. On the whole, this book is an altered and abridged version Pride and Prejudice. Lydia has been rendered to a mere plot device, Kitty only gets a passing mention and Mary has been omitted from the story altogether. Mr. Darcy's sister Danna is a female marshal (whose story has apparently been told in the first book of Lacy Williams's series) and nothing like Austen's Georgiana. Lady Katherine de Bourgh has been completely replaced with another character whose interference feels rather far-fetched. The only thing Mr. Collins shares with the original character is his name and the fact that he is married to Charlotte (who in this version was married from the start and had no previous relationship with Liza). Normally Westerns aren't really my thing, and I really disliked the last two Big Library Reads I tried to get through, but I'm glad I read the description of this one and realized it was a Pride and Prejudice retelling. And I'm even more glad I read it. It was quick; I spent less than a day on it, but it was also adorable and entertaining. My library doesn't have the other books in the series, but I've requested them because I'm really curious about the side characters the earlier books follow. Very pride and prejudice. in some ways it was better than Austen. There was no Mary, which is good. Plots were similar but different. I read this in one sitting, I mean come on it is a quivk 252 pages, but it was also good. Imagine Jane Austin's characters on a ranch in the American West and yoy get the picture. The book honors some of the best moments while making some changes that are good and help the story along. Rob Darcy and Liza Bennett struggle with feelings for each other while trying but failing initially to bring happiness to Janie and Nate. I liked the story, a good retelling. This was a cute and quick read. A bit of a jumble, not going to lie, but I do appreciate the Williams' take on a western retelling of Pride and Prejudice. She kept the spirit of the main characters and story fairly intact and interwoven between both her and Austen were moments that felt were from the 2005 film of the same name directed by Joe Wright. Williams definitely did some changes to better fit the western world and took liberty with some characters, which I will admit that I appreciated her This was a cute and quick read. Williams definitely did some changes to better fit the western world and took liberty with some characters, which I will admit that I appreciated her take on Mr. Collins and his arc but it also streamlined and shortened the story. This is a moderately charming retelling of Pride and Prejudice in olden-times Wyoming. All of the charm comes from the original story, of course, but that is enough to carry through. There is also a gratuitous moment of Rob Darcy pouring water on himself and having a clingy shirt, which made me laugh. So definitely gets an extra star for that. Not exactly sure why this merits being a Big Library Read (who even decides that?) but it was pleasant enough. A simplistic yet serviceable retelling of “Pride & Prejudice” as a Western. The author relies heavily on the reader’s knowledge of the plot and personalities of the characters from the original book. And I didn’t love some of her changes (no Mary and Charlotte isn’t Elizabeth’s friend) but it’s a fun and quick beach read. This was a “big library read” last time I got on Overdrive. You’d think they would pick a book with literary merit, right? Nope. Nobody could ever compete with the great Jane Austen, but this book never left romance novel territory. I had the idea that it would be like a book group choice, but I think more likely is my husband’s theory (when I described it to him because no man would ever read this) that this book wasn’t seeing any action so the author agreed in order to get publicity. What’s wr This was a “big library read” last time I got on Overdrive. You’d think they would pick a book with literary merit, right? Nope. Nobody could ever compete with the great Jane Austen, but this book never left romance novel territory. I had the idea that it would be like a book group choice, but I think more likely is my husband’s theory (when I described it to him because no man would ever read this) that this book wasn’t seeing any action so the author agreed in order to get publicity. 1) the characters are weak. Literally. Like, not only are they poorly drawn, but in typical romance novel fashion they spend a lot of time dwelling on past traumas and present disappointments but not really doing anything about them. I’m not talking about Jane Bennet’s quiet courage. It’s just a lot of failure-to-move-on and inability-to-deal-with-trials-in-a-healthy-way. I also disliked all of the changes she made to their personalities. Clever, witty Elizabeth becomes sullen, petulant Liza. Quiet, decorous, angelic Jane becomes emotionally stunted Janie. Silly, dim-witted Mrs. Bennet becomes sly, scheming Mrs. Bennett. Mr. Bennet, possibly the most complicated character of all in the original, hardly appears here. Mr. Darcy’s arrogance, clumsy and then sweet courtship, and ultimate heroic rescue lose most of their charm when we are constantly taken into his head. It’s way more fun to get to know him gradually, just as Eliza does. And what the author does to Georgiana Darcy, Charlotte Lucas, Mr. Collins, and Mr. and Miss Bingley—just sigh. And I miss poor left-out Mary Bennet! 2) the author can’t decide if she wants the dialogue to be Wyoming drawl or English gentry. 3) her choices of what to keep from the original story and what to change made no sense to me. 4) it seemed like this must be part of a series, and a lot of the characters must have appeared in previous books, because she kept referring to complicated back-stories that she never tells. Frustrating. 5) I alluded to this earlier, but I loathe entirely the romance novel habit of switching back and forth between the POV of the heroine and the hero. And here, she goes back and forth between all four. In my opinion, it’s lazy. Read this for the Big Library Read. this book is a cowboy/western adaptation of jane austen's pride and prejudice. i didn't like it. first of all, any adaptation or retelling of p&p has a really tough job. it's very, very difficult to create an adaptation of a work that is already so good! any attempt will be compared with the source material, and inevitably won't live up. dont get me wrong, there *are* good adaptations of p&p but this book is not one of them. the biggest blunder in this Read this for the Big Library Read. the biggest blunder in this adaptation, in my opinion, is the inclusion of chapters from darcy and bingley's pov. reading from bingley's and particularly darcy's perspective takes away from the reader's journey with liza--we, as the reader, know from the get-go that darcy has good intentions because we were there to experience it. in the original, we follow elizabeth's journey from believing darcy proud, arrogant, and disagreeable, to realising her own prejudice and discovering darcy's true character. plus, in the original, we still get to experience darcy's character arc, without needing chapters upon chapters explaining his pov. imo, chapters from darcy's pov weaken the narrative while adding nothing substantial to his character. also there's no Lady Catherine de Bourgh, so. why even bother. ok so it's a bad adaptation, but what if we just read it as a typical romance? -the characters are either flat or obnoxious. either way, not fun to read about, and i don't particularly care about where any of them end up. -the dialogue is??? kinda weird?? another review mentioned it seemed the dialogue was half american drawl, half posh english. there were a few places i realised i was defaulting the movie set in my head back to regency england, even though we're on another continent and a few decades later. This book improved as it went on, and I appreciated a truly new retelling of Pride & Prejudice that hasn’t been done a dozen times. I actually became quite invested in the book’s two main romances at times. But it also had that issue of instead of building up chemistry between characters, they would just feel “something” pass through them the second they laid eyes on each other—a love at first sight kind of thing. I just find this frustrating. It takes work to make characters have chemistry This book improved as it went on, and I appreciated a truly new retelling of Pride & Prejudice that hasn’t been done a dozen times. I actually became quite invested in the book’s two main romances at times. But it also had that issue of instead of building up chemistry between characters, they would just feel “something” pass through them the second they laid eyes on each other—a love at first sight kind of thing. I just find this frustrating. It takes work to make characters have chemistry and make the reader invested in the relationship, but when I’m just told that they have a mesmerizing attraction to each other without any actual interaction... meh. Among This is a retelling of Jane Austen's Pride and Prejudice, set in the American West during the pioneer days. Among my favorite changes to the characters and story are William and Charlotte Collins. In Austen's work, Mr. Collins is contemptible and only to be sniggered at, while Charlotte's decision to marry him is cast as pragmatically understandable, but really a clue to a serious character flaw. Those aren't the Collinses we meet here. Both Liza and Janie have somewhat more complicated personal histories than in Austen's work, and I like it. Overall, of course, the book doesn't rise to Austen's level, but it's both a fine homage, and enjoyable in its own right. Huh. I had no idea this was part of a series. It was featured on my library's Overdrive home page for some reason and advertised as being a Western version of P&P. Since I LOVE P&P, I had to try it out. I couldn't figure out how Williams decided what to keep from the original story and what to rewrite. I mean, she kept Kitty's name, but made it Rob Darcy!? I can understand writing out the Mr. Collins pseudo-romance from a length perspective, but I'm not sure why Darcy's sister had to be o Huh. I had no idea this was part of a series. It was featured on my library's Overdrive home page for some reason and advertised as being a Western version of P&P. Since I LOVE P&P, I had to try it out. I couldn't figure out how Williams decided what to keep from the original story and what to rewrite. I mean, she kept Kitty's name, but made it Rob Darcy!? I can understand writing out the Mr. Collins pseudo-romance from a length perspective, but I'm not sure why Darcy's sister had to be older and a marshal, and having a totally unrelated woman travel across the state to confront Liza re: Darcy was rather improbable. This was the first book of Lacy Williams, I have read. It won’t be my last. I found this thanks to overdrive’s Big Library Read. So far I have like everything from that. This was a western retelling of a Jane Austin book. I can’t compare the two since I haven’t read the classic. I will say while I knew where the story was heading, I still enjoyed the ride. I read this book as part of the OverDrive Big Library Read. It takes the Pride and Prejudice plot and places it in a western setting on a ranch, in the style of a Harlequin romance novel. If you like romance novels and cowboy calendars, this is the book for you. If you are a Jane Austen fan, it is less likely that you will enjoy it. 2.5 stars. This was a mediocre retelling of Pride & Prejudice with cowboys. Lots of repetitive words and phrases and quite a few typos. I feel bad saying this, but it's the truth. Cowboy Pride was boring. I had to force myself to finish & see how things turned out for Janie, Liza, and beaux. Meh. Sappy sweet, but good mindless read. I'm a sucker for pride and prejudice retellings. Even if there were quite a few typos. Read this as part of a read-along for my library. Certainly no Jane Austen, but I'm always a sucker for a Jane Austen retelling so I enjoyed myself on this one. Fast read. Cute play on Pride & Prejudice. Quite a few typos in the ebook version. Almost had to get out the virtual red edit pen! I’m a sucker for all things Pride and Prejudice and this western version was a fun way to re-read it! Whyyyy am I a sucker for retellings of Pride and Prejudice. Do not recommend. Uneven and unbelievable. Not bad as JAFF goes. There were enough twists from P&P to make it enjoyable. I didn't feel immersed in the Old West, though. In fact, for the first couple of chapters I thought it was set in the modern West. Until I noticed they were all driving buggies, and I'm like, are the Bennets too poor for an F-150? Also, as others have noted, it needs a good copy editing, preferably by someone who knows how to use an apostrophe. But, overall, not bad. Read for the Big Library Read. Surprised they chose such a basic retelling of Pride & Prejudice instead of something with more depth to it. I also agree with many reviewers that the numerous copy editing errors was distracting and it didn’t seem much different from the original at all. Eligible was a much more fun and interesting retelling if you are into Pride & Prejudice. Last summer I saw a great one-man play of Pride and Prejudice so decided give this version of Pride and Prejudice a read. I enjoyed it. It was easy to get into and light reading. 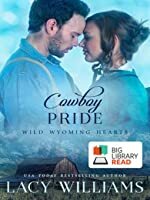 Cowboy Pride is the third book in the Wild Wyoming Hearts series and written by Lacy Williams and is the Big Library Read Digital Book Club via the Toronto Public Library book for the July 9 – July 23 period. The novel surrounds the Bennett sisters – Liza and Janie and their potential lovers in Rob Darcy and Nathan Bingley respectively and how first impressions and emotions could get in a way of a romance. It is in intriguing concept advertised as a Wild West version of Pride and Prejudice with d Cowboy Pride is the third book in the Wild Wyoming Hearts series and written by Lacy Williams and is the Big Library Read Digital Book Club via the Toronto Public Library book for the July 9 – July 23 period. The novel surrounds the Bennett sisters – Liza and Janie and their potential lovers in Rob Darcy and Nathan Bingley respectively and how first impressions and emotions could get in a way of a romance. It is in intriguing concept advertised as a Wild West version of Pride and Prejudice with dual love stories. Liza Bennett has two missions in life: to keep the family's shop above water and to guarantee her timid sister discovers love. Sparks fly when she meets rancher Robert Darcy at a town dance, yet when she overheard him insulting her she vows to forget about him. However, it seems that Rob Darcy is instantly attracted to the vivacious Liza Bennett but a lack of social skills and the promise he's keeping ruin his chances with her. Janie Bennett was once jilted and has some reluctance in finding and falling in love again. However, when she meets Nathan Bingley, she couldn't help herself to succumb to Nathan Bingley's charming demeanor. Nathan Bingley desperately wants a wife and a family of his own, but he is unsure if he could trust Janie Bennett to return his feeling. Cowboy Pride was difficult for me to evaluate because of three reasons. Firstly, it's a romance book – not that there's anything wrong with romance – I don't mind having some of it in the novels I choose to read, but I do not generally gravitate towards books that has romance as its central point. Secondly, it's a western – again nothing wrong with Westerns – it's just that I don't generally gravitate towards them. Finally, Cowboy Pride is the third in a series of books, which triggers my O.C.D. in wanting to read the first two books first before reading this. While I doubt the first two books would have much bearing on this particular book, I can't help to think that this fictional universe would be better if I read them. Cowboy Pride was advertised as a modern Western retelling of Pride and Prejudice. However, the execution of such a claim was much to be desired – it was mediocrity done at best. It's probably not fair to compare Cowboy Pride with Pride and Prejudice, because very few can match Jane Austin caliber of writing, but when one takes on a challenge in retelling such a classic book – it should come close to Jane Austin. However, if we take Pride and Prejudice and Jane Austin out of the equation, Cowboy Pride is simply just the typical love story set in the West – or at least that was what my friend told me when she read the book with me. Besides the being typical, she told me that it was also mediocrity written too. While I normally don't take other people's account into my review – I did in this case, because I generally don't gravitate to romance and feel ill equipped to review one without input from those who do. Lacy Williams is a wife and mom from Oklahoma. She loves dogs, reading, hiking, and watching movies. Her debut novel won ACFW’s prestigious Genesis award before being published. She promises readers happily-ever-afters guaranteed. Lacy combines her love of dogs with her passion for literacy by volunteering with her therapy dog Mr. Bingley in a local Kids Reading to Dogs program. Lacy loves to hear f Lacy Williams is a wife and mom from Oklahoma. She loves dogs, reading, hiking, and watching movies.